Wicklow Uplands Council works for the sustainable use and enjoyment of the local landscape in partnership with those who live work and recreate there. 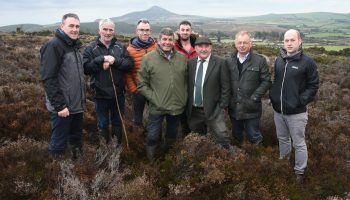 Wicklow Uplands Council, in partnership with Teagasc, has been awarded funding for the Sustainable Uplands Agri-environment Scheme (SUAS) pilot project for the Wicklow/Dublin uplands. SUAS is one of the successful European Innovation Partnership for Agriculture, Productivity and Sustainability (EIP-AGRI) projects. The EIP-AGRI initiative in Ireland is being implemented by the Department of Agriculture, Food and the Marine (DAFM). EIP-AGRI projects involve the cooperation of farmers, scientists, advisors, NGOs and others coming together in Operational Groups to address a specific issue or to take advantage of a new opportunity. Wicklow Uplands Council has assembled an Operational Group with a range of expertise and experience to support the SUAS project. Members of the Operational Group include upland farmers along with experts in hill production, agri-environment, ecology, rural development, water quality, conservation, public relations and administration & finance. The objective of the five-year, locally led pilot, is to develop practical solutions that will address the complex agricultural, environmental and socio-economic challenges associated with the land management of commonages and farms on the Wicklow/Dublin uplands. It evolved from local research that identified the poor to bad conservation status of the uplands and the uplands farmer’s attitude, understanding and responses to it. The pilot will grow stakeholder ownership of the local challenges and provide a flexible supporting framework to assist them in developing solutions. We are seeking to recruit a full-time project manager to implement the SUAS pilot project on behalf of Wicklow Uplands Council SUAS Clg. The project manager will work closely with the Operational Group and have significant responsibilities for the implementation of the pilot. The project manager will operate from the SUAS Project Office which is based at Wicklow Uplands Council office, Parish Hall, Main St, Roundwood, Co Wicklow. A secondment arrangement may be considered to fill this position. Developing and maintaining a co-operative working relationship with participating groups and individual farmers. Facilitating and supporting the establishment and operation of commonage groups. Facilitating and supporting participating commonage groups and upland farmers with the development, implementation, monitoring and evaluation of their upland management plans. Assisting participants with SUAS payment claims and the verification of payments claims to the Operational Group. Organising training courses and necessary support required by participating farmers. Leading the delivery of the auction-based measures by developing suitable proposals and innovative ideas with participating farmers. Working and liaising with the Wicklow Upland stakeholders to achieve a successful and beneficial pilot outcome. Organising the necessary dissemination activities that are required to promote and engage shareholders locally and nationally. Meeting the pilot required governance standards. Organising and managing the activities of the Operational Group. Preparing and submitting the progress and annual reports to the DAFM. The successful applicant will be a self-starter who can work independently and as part of the project management team. He/she must have leadership and motivational skills with strong organisational and people management skills and a proven track record in project management and governance. The post requires an individual that will maintain and deliver to the highest professional standards. The successful applicant will have a practical knowledge and experience of; upland farming systems, habitat management and working with farmers and stakeholders in both group and individual settings. Candidates must have a full driving licence and suitable transport. The post will require time spent outdoors on upland sites and will involve meetings outside of normal office hours. A degree in agricultural or environmental science or relevant discipline. A post-graduate qualification or relevant experience in project/upland management or in agri-environment schemes would be a distinct advantage. The successful candidate will report to the Operational Group on a regular basis. Line management will be provided by the Project Lead. Duration: The post is a fixed term contract for the duration of the SUAS pilot project i.e. until 31st December 2022. The successful applicant will be an employee of Wicklow Uplands Council SUAS Clg for the duration of the contact. Employers PRSI and tax will be deducted at source on behalf of the employee. Email applications with CV and cover letter to: Brian Dunne at the above address.